This study was conducted to evaluate the accuracy of magnetic resonance imaging (MRI) in diagnosing meniscal tears in patients with anterior cruciate ligament (ACL) tears and to determine the frequency of missed meniscal tears on MRI. This prospective comparative study was conducted from 2009 to 2012. 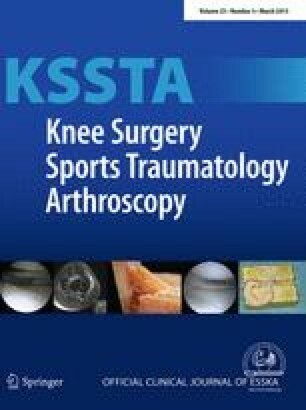 Patients with ACL injuries who underwent knee arthroscopy and MRI were included in the study. Two radiologists who were blinded to the clinical history and arthroscopic findings reviewed the pre-arthroscopic MR images. The presence and type of meniscal tears on MRI and arthroscopy were recorded. Arthroscopic findings were used as the reference standard. The accuracy, sensitivity, specificity, negative predictive value (NPV), and positive predictive value (PPV) of MRI in the evaluation of meniscal tears were calculated. A total of 65 patients (66 knees) were included. The sensitivity, specificity, accuracy, PPV, and NPV for the MRI diagnosis of lateral meniscal tears in our patients were 83, 97, 92, 96, and 90 %, respectively, whereas those for medial meniscus tears were 82, 92, 88, 82, and 88 %, respectively. There were five false-negative diagnoses of medial meniscus tears and four false-negative diagnoses of lateral meniscus tears. The majority of missed meniscus tears on MRI affected the peripheral posterior horns. The sensitivity for diagnosing a meniscal tear was significantly higher when the tear involved more than one-third of the meniscus or the anterior horn. The sensitivity was significantly lower for tears located in the posterior horn and for vertically oriented tears. Therefore, special attention should be given to the peripheral posterior horns of the meniscus, which are common sites of injury that could be easily missed on MRI. The high NPVs obtained in this study suggest that MRI is a valuable tool prior to arthroscopy.